At the southern tip of Vancouver Island, Victoria is sheltered by mountains and influenced by the warm North Pacific current - creating the mildest climate in the whole of Canada. Parks and gardens in this pretty city are festooned with foliage and flowers throughout the year. Only the narrow Juan de Fuca Strait separates this (the largest island on North America's Pacific coast) from the USA's Olympic Peninsula with its often snow-covered peaks. The capital of British Columbia, Victoria is quiet, skyscraper-free and largely administrative and residential. To these charms is added a downtown area set around the beautiful Inner Harbour, which retains its Victorian heritage buildings and atmosphere. In the Empress Hotel, people still gather for afternoon tea throughout the day. British Columbia's provincial museum is situated midway between the Parliament Buildings and the Fairmont Empress Hotel. It is by far the best museum of natural and cultural history in Canada, with many three-dimensional displays offering a feast of sights, smells, and sounds. Walk through a rainforest, view animals on West Coast beaches and in tidal wetlands, sit among aboriginal ceremonial poles and masks, walk through a big house, and learn of First Nations people's struggles after European settlement. Other interactive features include a replica HMS Discovery - the ship that brought Captain Vancouver to these shores, and a street of shops in Old Town. Outside, Thunderbird Park is home to traditionally carved memorial and house poles. Nearby, the small mid-19th century, Helmcken House is the oldest residence in British Columbia still standing on its original site. The house once belonged to J.S. Helmcken, a practicing doctor and local politician. He campaigned vigorously for the then British colony of Victoria and British Columbia to join the newly established confederation of Canada. Built in 1908 for Canadian Pacific, like the Château Frontenac in Québec City, the Fairmont Empress Hotel on the Inner Harbour is one of Victoria's best-loved landmarks. Architect Francis M. Rattenbury designed the Empress, and entering the vast lobby of this luxurious hotel is like journeying back in time to before the First World War. Afternoon tea, served with great style, is an experience for any visitor. An extension on the north side of the Empress Hotel houses a collection of several dozen scenes in miniature at Miniature World. The models of historical events, castles, and dollhouses captivate young and old alike. For a visit to one of the area's premier tourist attractions, follow Highway 17A north for 22 kilometers to the magical Butchart Gardens at Brentwood Bay on the Saanich Peninsula. Here, in 1904, Jennie Butchart, wife of a wealthy quarry owner, started to lay out a fragrant garden in abandoned limestone workings. Flourishing, not least because of the mild climate, the gardens have since been developed into a 20-hectare horticultural tour de force without rival in Canada. The Italian garden, rose garden, Japanese garden, and sunken garden are among the loveliest. Open spaces among the pools, fountains, and the many exotic plants are used for artistic and musical performances. Dominating the south side of the Inner Harbour is the imposing seat of British Columbia's provincial government, the Parliament Buildings. Designed by Yorkshire architect Francis M. Rattenbury and erected in 1897, the imposing stone buildings have neat, orderly gardens and are very attractive in appearance - especially in the evening when lit by festoons of lights. Perched high above the massive dome is a gilded statue of Captain George Vancouver (1757-98), who accomplished the first circumnavigation of Vancouver Island. Figures of famous personalities from the province embellish the façade. A large statue of Queen Victoria surveys the Inner Harbour from the terrace. Tours of the town center by horse-drawn carriage leave from nearby. Adjoining the Old Town is Victoria's small, but nevertheless charming, Chinatown. Entered through a conspicuous gate, it occupies just two blocks close to Government Street and Fisgard Street. A century ago, 8000 people lived in the Chinese quarter. In 1971, it became a designated historic district. One of the favorite sightseeing stops is the exceedingly narrow Fan Tan Alley. Green and well tended, Beacon Hill Park is a favorite recreation area close to the town center. From its highest point there are lovely views across Juan de Fuca Strait to the snowy peaks of the Olympic Peninsula. A milestone on the southwest edge of the park marks the western end of the Trans-Canada Highway. Victoria's fairy-tale mansion, Craigdarroch Castle, is considered a gem of Victorian architecture. Immigrant Scottish entrepreneur Robert Dunsmuir commissioned the home for his wife in the 1880s. Dunsmuir made his fortune in coal mining, but died before his mansion was completed. The house is situated in a particularly affluent area of Victoria. Elegant Rockland centers on Rockland Avenue, which is lined with grand heritage homes including Government House - the official residence of Her Majesty's representative in British Columbia. The house itself is closed to the public but the beautifully kept gardens are a delight. The gun batteries at Fort Rodd Hill National Historic Site, about 13 kilometers west of Victoria, used to guard the sheltered waters of Esquimalt Harbour, once a British naval base. The guns were in service from 1895 to 1956. Today, the well-preserved fortress can be visited. Nearby, the point's Fisgard Lighthouse was the first on the west coast of Canada, and is a definitive local landmark. The former Court House (1869) in Bastion Square is now the Maritime Museum of British Columbia, displaying a host of items from the age of sail. A centerpiece to the museum is the "Tilikum", a large Indian canoe in which, at the beginning of the century, some fearless souls voyaged to England. Also commemorated - appropriately enough in the old Court House - is the legendary Richard Matthew Begbie, whose administration of justice at the end of the 19th century led to his being christened "the Hanging Judge." 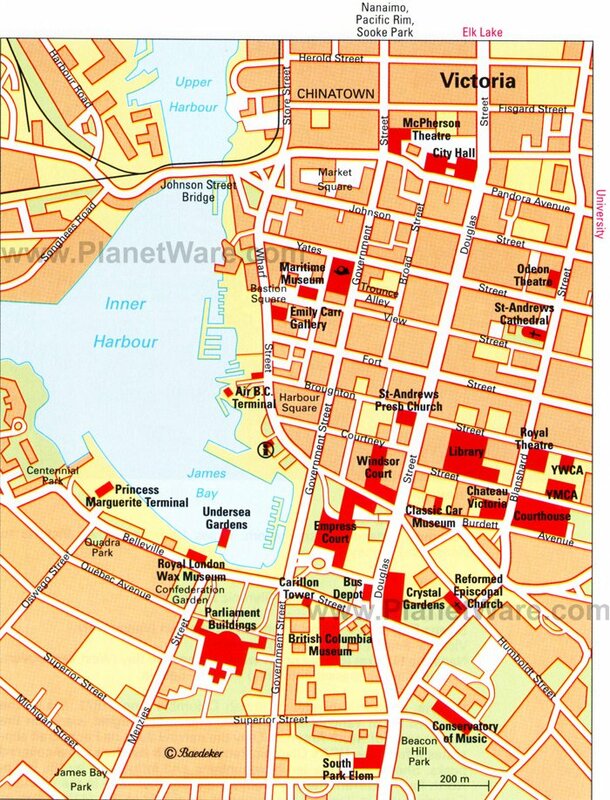 Surrounding Bastion Square are the principal thoroughfares of Victoria's Old Town - Wharf Street, Government Street, and Douglas Street running north-south, and Johnson Street, Yates Street, and Fort Street crossing them. A lovely area to stroll, Old Town boasts some historic buildings and old-fashioned shops such as Roger's Chocolate and the tobacconist E.A. Morris. Hatley Park National Historic Site consists of a castle built in 1908 by former British Columbia Premier and coal baron, James Dunsmuir, and an Edwardian estate with Japanese, Italian, and rose gardens. Visitors can choose to walk through the gardens or take a guided tour of the castle - now the base of Royal Roads University. Located near Butchart Gardens, the Victoria Butterfly Gardens are indoor tropical gardens designed to house up to 75 species of exotic butterflies and moths, plus some birds, fish, and reptiles. An interesting indoor landscape incorporates waterfalls, trees, and flowers. Enter a world of insects and spiders at the Victoria Bug Zoo. The facility has a range of bugs from all over the world, many of which visitors can hold. The critter-focused attraction is located near Victoria's Inner Harbour. Abigail's Hotel: four-star luxury, romantic four-poster beds, wood-burning fireplaces, free breakfast and appetizers. Victoria Regent Hotel: mid-range waterfront hotel, harbor views, fantastic location, spacious suites with full kitchens, floor-to-ceiling windows. Best Western Plus Inner Harbour: affordable rates, harbor location, welcoming staff, outdoor heated pool, whirlpool and sauna, hot breakfast included. Capital City Center Hotel: budget hotel, walking distance to harbor area, outdoor seasonal pool, comfortable beds, 24-hour concierge.